Leading Manufacturer of grapes punnets, pvc plastic strawberry tray and strawberry box from Vasai. We are manufacturing Punnets and Containers for fruits like grapes, strawberry etc. We have a wide range in punnets and containers for fruits packing. We also provide punnets and containers according to our client demand and requirements. Being among the leading group we are manufacturer, supplier and exporters of Strawberry Tray. 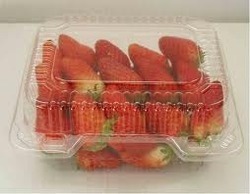 These are durable in nature; these Strawberry Trays guarantee safe storage of strawberries and improve their shelf life. Our Strawberry Trays are available in a variety of sizes and at most affordable price. Available in various designs, shapes and colors. Our wide range of environmental friendly box is broadly used for supplying perishable and non perishable products. These are offered by us at the most reasonable cost. 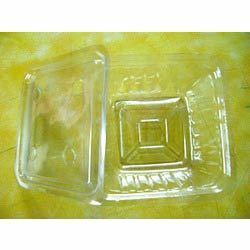 We are engaged in manufacturing exclusive collection of Plastic box For food Industry. Manufactured using optimum quality raw material, these are appreciated for their light weight, durability and leak proof property. Available in various designs, shapes, sizes and colors, our range is used for packaging and serving frozen food, chocolate, panipuri and other food products. are engaged in manufacturing exclusive collection of Plastic Trays For Catering Industry. Manufactured.